The aurora borealis – nature’s light show. There are few other naked eye celestial events that are so beautiful and breath-taking. From subtle bands of green across the northern horizon to waves rippling overhead and colourful pillars of light rolling across the sky, it’s no surprise that people go through such great lengths to see this wondrous sight. The source of aurora is the Sun. The sun regularly discharges charged particles from its atmosphere via solar mass ejections due to the violent fluctuations of its magnetic field. These ejections are thrown out into space in all directions. When the Earth crosses paths and collides with these charged particles, they get caught in our magnetic field and pulled in towards the poles. Glancing blows will produce weak aurora while direct hits may produce all-out geomagnetic storms. The different colours seen during an aurora are due to the type of gas particles that are colliding and their altitude. The common pale green colours we associate with aurora is produced by charged oxygen at about 100km altitude crashing into the Earth’s atmosphere. The rarer red / magenta hues and blue / purple bands are caused by oxygen and nitrogen at much higher altitudes of about 300km. What’s the Best Season to See the Aurora? Technically, there is no season or time of year where it’s more active. The Sun is very active and constantly spewing out material which collides with Earth. The aurora happens year round regardless of seasons. However, winter tends to be the best time to view the aurora in the northern hemisphere. As we move into fall, the days get shorter and nights get longer. With longer nights, the chances of seeing aurora increase since we have more darkness. That said, typically, the aurora tends to be more intense and seen farther south in the middle of the night when the Sun is completely on the opposite side of the planet from your geographical location. This tends to be in the 11PM – 3AM time window. Of course, there’s no guarantee this will happen. Such is the nature of forecasting weather, be it on Earth or in space. The aurora also affects the southern hemisphere just as it does the north. However, it’s not often seen from land except in Antarctica, southern Australia, and the southernmost tip of South America. During more intense geomagnetic storms, the aurora may also be visible from the Horn of Africa. The reason the Aurora Australis isn’t seen as often or anywhere near as popular as its northern sibling is that most of the southern hemisphere at latitudes where the aurora is visible is over oceans. By examining the Southern Hemisphere OVATION Map, we can see how the northern and southern hemisphere differ in terms of population. The far southern hemisphere is mostly open ocean compared to the north where the vast majority of the continents and population are located. This is why it’s rarely seen in the south compared to northern latitudes. The Kp-index was develpped by Julius Bartels in 1938 and is the worldwide standard by which auroral disturbances of Earth’s magnetic field are measured. It quantifies the magnitude of geomagnetic storms based on 3 hour measurements of the K-indices. The index measures the intensity of aurora on a scale of 0-9, with 0 indicating little to no activity, and 9 indicating the most intense geomagnetic storms. As the K-index value rises, so does the intensity of the aurora and the farther south (or north in the case of Aurora Australis) its effects will be visible. Once aurora activity reaches Kp 5, it’s considered a geomagnetic storms. The storms are classified G1 to G5. It’s during these periods of time that geomagnetic activity is very high due to a heavy concentration of charged particles in the Earth’s magnetosphere, which causes magnetic reconnection and snapback to occur. The visual effect of this is described above in the What Causes the Aurora section above. If you’re into chasing the aurora for both observation and photography, this is what you want! 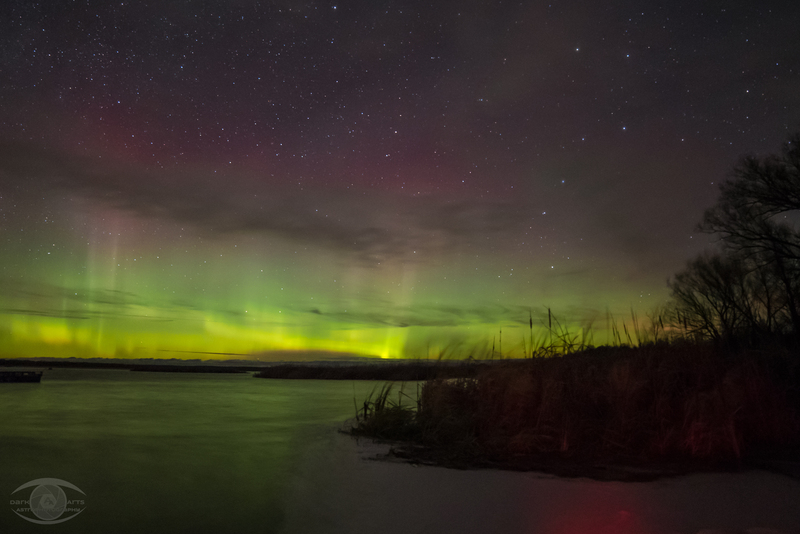 Witnessing an overhead geomagnetic storm is a sight to behold and something astrophotographers travel great distances to experience and photograph. However, with beauty comes with hazard. Intense geomagnetic activity can wreak havoc on communications satellites and even the electrical grid on Earth. The Carrington Event of 1859 – an intense geomagnetic storm – caused aurora that were visible across the entire planet right to the equator. It also blew out telegraph systems – the most high-tech communications systems of the day – all over the world. To this day, the Carrington Event is still the strongest geomagnetic storm on record. A geomagnetic storm of that intensity occurring today would cause trillions of dollars in damage to our power grids, communications systems, and our sensitive electronics on Earth. It would take years to restore our electrical and communications systems. Although the aurora itself wouldn’t be harmful to anyone directly, life as we know it would essentially cease to exist. What are the chances I’ll see the aurora? Even with the best scientic data, aurora are notoriously hard to predict. The farther one moves from the poles, the lesser the chance of seeing it while the difficulty in predicting it increases. More northern latitudes will see the aurora more regularly with a higher intensity. It will also be higher above the horizon. Areas like northern Canada, Alaska, northern Russia, Scandinavia, Iceland and Greenland see aurora on an almost a daily basis while it takes stronger geomagnetic activity for an aurora to be seen farther south. For the latest, up to the minute information on current K-indices and aurora map, refer to my Aurora Forecast page. From there, you’ll have access to the most current data and maps.